WARNING: The following images may be disturbing to some. Proceed at your own risk. Ahhhh, sock knitting...it is addicting! After starting a pair of worsted weight socks for my brother, I decided to cast on a more "decorative" pair with smaller needles and self-striping yarn. I loved the ruffled edged sock pattern, so I chose the yarn and started. 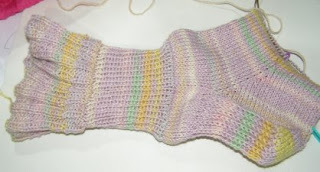 You knit the ruffled part of the cuff and then push it through the center of the needles so that you can knit the rest of the sock. You can see how pretty it was--and how nicely the yarn striped on the heel flap. I had done the heel flap, turned the heel and did the gusset decreases and was well on my way to the toe. Here's a picture of the sock with the ruffled part unfolded. See how it is the wrong side now while the rest of the sock is right side out. 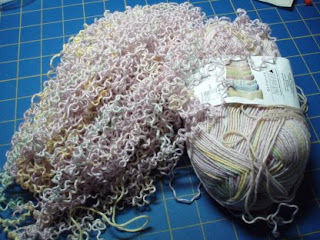 Yes, I pulled out my 40 inch circular needle, removed the markers and gave the yarn a good tug--resulting in the mass of crimped yarn you see above. Then I proceeded to hand-roll the entire skein into a center-pull ball that has been cast on for a new sock like my first pair--good old K3 P1 ribbing and plain old stockinette stitch foot. But I have to say--I think it may be the yarn--I'm still not having that truly euphoric sock knitting experience even so. But fear not, I have multiple skeins of sock yarn--already rolled into center-pull balls--from which to choose should I pull the fickle route with this sock too. I only have 13 more rows on the cuff on my brother's second sock and then I can do the fun stuff--heel flap, heel turn, decreases--yes, yes, I can see you shaking your heads--she's sooooo weird to like that stuff. But remember I am the one who loves to hand piece the blocks with the most set-ins I can get--that's the fun stuff! OK--go stitch something--either quilting, knitting, embroidery--whatever makes your heart sing. And, for you inquiring minds--yes I have been hand-quilting--only the border to finish on a small wallhanging, and working on hand-pieced hexagon blocks for the fall. I'll be waiting for you, my pretties! 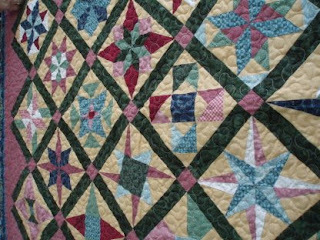 Starting in September 2007, students hand-pieced two blocks per month to make the quilt I call Monthly Bliss 2. 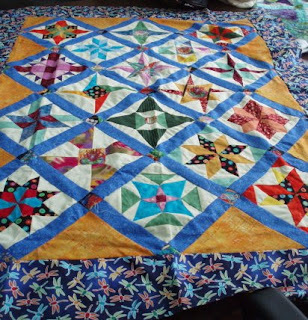 Eighteen hand-pieced blocks, sashing, cornerstones, borders--add hand or machine quilting and you have--something to be extremely proud of. Here are pictures of several of the quilts (some completely finished and others in top form). 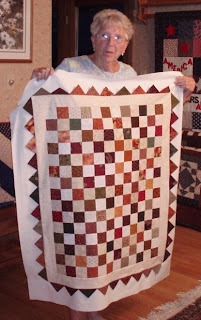 First is Sue Y. with her completed quilt. It is absolutely fabulous in terms of both workmanship and fabric choices. 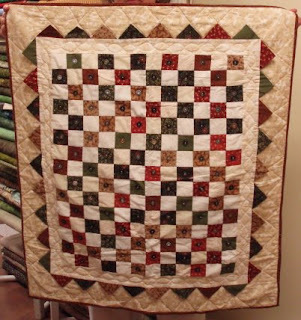 Here is Mary Ann C.'s quilt--finished except for the binding. She used a beautiful border stripe (not shown) to finish this piece. 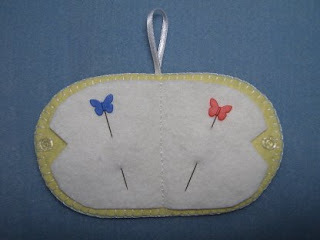 She also added a small inner border to make the entire center float. 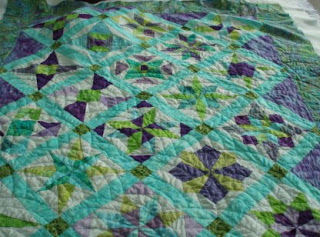 Cathy M. originally started with a different border fabric, but after piecing the blocks, decided that she wanted something different. We found this multi-colored dragonfly print that picked up all the colors from the blocks. And the orange-y batik was perfect for setting triangles. She may use her original border fabric as part of the backing and is contemplating a dragonfly motif for the quilting. Bettina K. is hand quilting her top with the Baptist Fan pattern. Done in cool shades of purple, lime and aqua, it makes one think of swaying in a hammock on the Caribbean--so tropical and sun-dappled. Many others from the classes are still working. Several have the blocks done and are selecting sashing and borders. Some have the three layers basted and wanted me to wait to show their quilt until it was finished. These quilts are from the classes at O'Susannah's in Watkins Glen, NY. I'll post pictures of the quilts done at Calico Gals as they become available. Ten months seems like a long time when you start a long-term class, but I think everyone will agree that it goes by in the blink of an eye! How can it be August 10, 2008, already? Remember when we were struggling with Y2K? How can it be eight years later? It's hard to remember that time is finite--and we don't know how much any one of us has. So try not to get too bogged down in the day-to-day stuff--do something fun--something just for you--or something that includes as many friends and family as you'd like. Make whatever it is something to remember when things are not going well. Life is a journey--and we all know what the end of the ride is--so whoop it up now! Laugh more--it's good for your health and the laugh lines look better than the frown ones. And, have you noticed, when you smile, others smile too. Spread it around! Til next time--when the Sock Gone Bad rears its ugly head. P.S. Even if you are not a knitting fan, check out this website. www.yarnharlot.ca/blog/. Stephanie Pearl-McPhee is currently on vacation in Newfoundland and the pictures are fabulous. 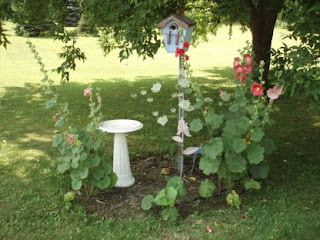 Her blog is wonderfully funny at all times, so when you need a laugh, check it out! First is Sharon Gates's Spring Tulips which she started at a retreat that Anita Shackelford and I have been hosting for the past five summers. I just love the fabrics she chose for this design. Way to go, Sharon! Also in the totally finished category is this Friendship Quilt by Sue Radcliff. This is NOT strip pieced! Sue cut each square and then pieced the rows. Prairie points give it a folk art flavor. 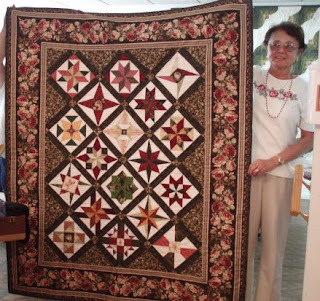 Sue used a variety of buttons to tie the quilt and then added quilting to finish it. How fun is that! Also in the Friendship Quilt grouping (but a different group of students than Sue was in) are Shirley S. and Debbie W. of Auburn. These tops were recently completed in class, thus there was no time for these ladies to get them completely finished! As a group, five students set a theme of fall and pooled their fabrics--45 different darks and about 25-30 lights. Each quilt looks different because of the random piecing method used. This is Debbie's quilt. Please note that on all photos any weird warping effect is due to my photography and is not the quiltmaker's fault! Excellent job, ladies! 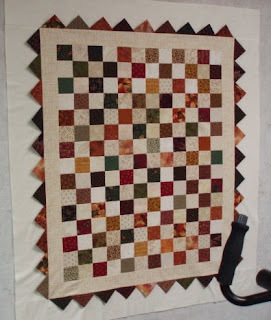 The next post will be photos of my Monthly Bliss 2 class and some of their quilts--both tops and finished! The post after that will be "Sock Gone Bad". Stay tuned! 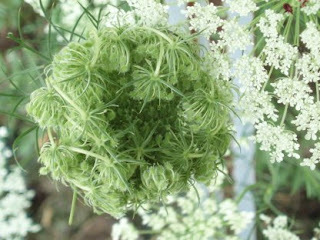 Yes, it is Queen Anne's Lace! 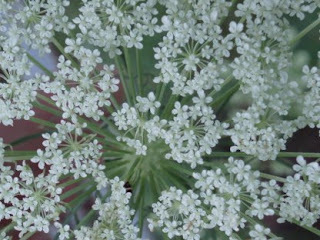 A common "weed" that is so pretty that I've let some of it grow in my flower beds this year. When I was weeding about a week ago and actually looked into the center of an as-yet-unfolded blossom, I was amazed at how pretty it was. That's when I decided to run the contest. Must be lots of people look at flowers this way--I'm impressed. For the record: Jay, Sheila, Karen, Cindy, Julie and Carole were correct. I assigned each person a number and then had a disinterested third party choose a number between 1 and 6. The number was 4--and the winner is...Cindy from St. Regis Falls!!!! Congratulations, Cindy! 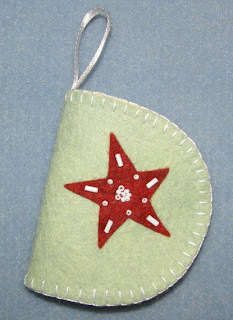 The colors are a bit off in the photos; they are a minty green and soft yellow, with a red star and white beads. And, yes, the butterfly pins are included! This needlecase is adapted from a pattern by Crab-apple Hill. I hope you enjoy it! Many thanks to all who participated. It was great fun to look each day to see who had responded. I could not include BMAC in the drawing even though she claimed to know the correct answer--and all the guesses were wonderful! Now, let's turn to the rumor I've found to be true. We all know that housework makes us ugly--think about it--do you have a happy, carefree attitude when doing housework? Or do you snarl and snap at anyone in the vicinity. No matter how great a job you do, you have to keep doing it over and over and over and over.... You get the picture. Well, I had heard a rumor that housework could be actually dangerous to your health. But...I threw caution to the wind and did a bit of housework on Friday and.... I sprained my right foot! (Not the ankle--the foot!) I know, I know--how could that possibly happen? Well, I was sorting my quilting magazines and putting them in the cardboard magazine boxes and aligning them on shelves. I needed to sit on the floor to achieve all this and...I felt what I thought was a sting as I sat down. I didn't think much of it, completed the task and finished vacuuming, etc. The foot started swelling immediately, but again...so what? I was up most of the night in pain and in the morning finally hitched a ride to "Prompt Care" at the local hospital (a step below emergency). X-rays were taken and, as I suspected, it was a soft tissue injury, no broken bones, but better safe than sorry. So I have been sitting with my foot elevated and ice on it for the past 24 plus hours. No driving, no dancing on the island. My conclusion--I will never do housework again! It's waaaaayyyyy too dangerous. Consider yourselves warned! In the next post I have new pictures of student quilts and who knows what else. Stay away from housework until at least then!